Looking for cheesy goodness with a hint of sweetness? That’s Rocky's Island Pizza! Our pizza shop in Grand Island, NY serves fresh and hot pizza with your choice of a traditional red sauce or our signature sweet sauce. Throw on any combo of toppings that you love and you’ve got yourself a delicious, made-to-order pizza you can enjoy your way! Don’t let your pizza get lonely. Aside from our specialty pizzas, we also offer a wide selection of delicious chicken wings and fingers, garlic bread, and other appetizers and sides, including tacos and desserts! Whether you’re in the mood for pizza and wings or a hearty sub and fries, our pizza shop can hook you up. 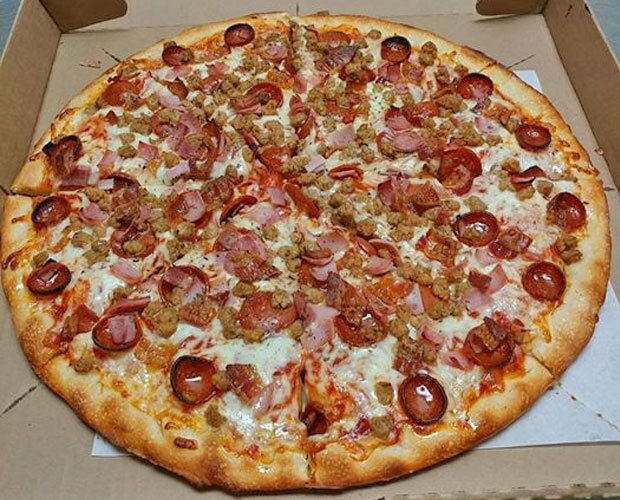 Your search for the best pizzeria in Grand Island, NY ends with Rocky's Island Pizza. Our local pizzeria has been serving up fresh food for years. We are well-known for our freshly made pizzas and our signature sweet pizza sauce. We keep you and your needs in mind by offering family-sized portions at great deals! Visit our pizzeria regularly to check out our everyday specials. Aside from our mouthwatering food offerings, we are also proud to be the cleanest pizzeria on the island. We make sure that our staff follows effective safety, hygiene, and food sanitation processes. Rest assured that we will not only serve you with delicious meals, but we will also provide you with an unforgettable dining experience each time you visit us. Don’t miss our pizzeria’s signature sweet pizza sauce, garlic and sesame seed crust, or our Boom Boom sauce. We also have your all-time favorites, including chicken wings with a variety of sauces to choose from, chicken finger pizza and subs, or customized subs you can create just the way you want them! We even have gluten-free options available! Dine in Our Pizzeria Today! Discover the true flavors of a perfectly made pizza and dine in at Rocky's Island Pizza today! Have a taste of our famous sweet pizza sauce and other delectable dishes made fresh just for you. We also have an upcoming new breakfast menu and everyday specials. Call us to schedule a pick-up or delivery service. If you have questions about our pizzeria menu, don’t hesitate to get in touch with us. Online ordering will be available soon. Try Our Specialty Pizza and More! Rocky's Island Pizza delivers to nearby areas with a minimum order worth $10. Try our specialty sweet pizza sauce, Boom Boom sauce, and traditional favorites like crispy chicken fingers, subs, tacos and more! Give our local pizzeria a call today to place your order for pick-up, dine-in, or delivery!